Most of Domainers are know leadrefs.com, the service that was generate a list of potential end-users by matching the entry domain against TLDs zone file and extract all similar domains, but the problem with LeadRefs results was actually the type of those potential end-users, it couldn’t detect which domain is developed and which one is not. Anyway, LeadRefs has shutdown several months ago and people who were using that service are probably convert to Zfbot which do a similar job but for another purpose. Now with Zfbot the problem isn’t different, it also show you the results based on your entry keywords without much details about the domain status. And here when the Domain Crawler tool is come. 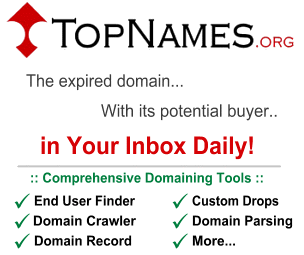 With domain crawler tool which presented by TopNames.org, you can crawl domains in bulk and check the status of each one in a sortable table. This tool is cover most domain statuses (Active, Parked, Blog, Forum, Redirected, Adsense, For Sale, Disabled, etc). In this article we want to benefit from Zfbot results and convert them into a list of useful potential end-users using the Domain Crawler tool. 1- Go to Zfbot.com and enter your domain keyword by filling “Start With” or “End With” field or both (it depends on your domain name). E.g: if your domain is PetSupplies.com, enter “Pet’ in start with and “Supplies” in end with then click Search. 2- Export the results and copy the whole content, no need to sort or filter anything. 3- Go to Domain Crawler page and paste the content then click “Light Check”. All domains will be parsed automatically. Now your potential end-users list is ready, simply sort the table and get all “Active” websites on the top. This entry was posted in Domaining Tips by Mohammed. Bookmark the permalink.